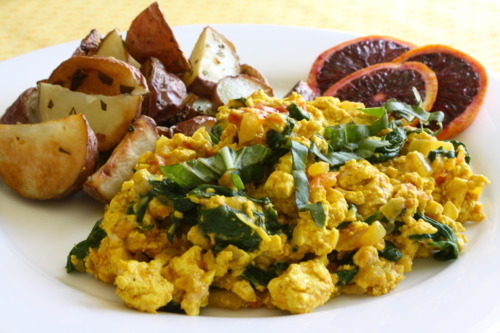 It’s the weekend & you know what that means: tofu scramble time! My weekday breakfasts typically consist of either quick cooked oats & fruit, or a green smoothie that I can take with me out the door. Even though I get up super early, I am not left with much time to get creative, so I save that for the weekend. I came up with this scramble a few Sundays ago, ever since then I’ve craved it every weekend. It’s a vegan take on the classic “scrambled eggs florentine” which was my favorite egg dish before I gave them up. This mediterranean inspired version is composed of crumbled extra firm tofu mixed with spices, spinach, basil, fresh tomato, & Daiya Mozzarella, which makes for a wonderfully creamy & savory scramble. Dare your omnivore friend to ditch the eggs & serve them up a dish of this. I guarantee they won’t help but fall in love! Saute the garlic & onion in olive oil in a large skillet for 3 to 5 minutes, or until onion is softened. Add remaining ingredients except spinach, basil & cheese, & cook, stirring frequently for an additional 10 minutes. Add spinach & basil cook a minute or two, just until wilted, stirring well. Turn off the heat & add vegan mozzarella, stirring until combined. Garnish each portion with a chiffonade of fresh basil. What goes better with a scramble than a side of crispy potatoes? I’m not a greasy hash browns gal, but I happen to love red potatoes roasted with a bit of oil, sea salt & fresh rosemary. I changed up my basic recipe a bit by using Lemon Infused Avocado Oil that I picked up at the farmers’ market. It is also amazing on salads, & drizzled over veggies, & I decided to use it here too, just to liven things up a little. Combine all ingredients in a large bowl & toss to coat potatoes. Transfer potatoes to a large foil lined baking sheet. Roast 25 to 30 minutes, until tender & golden. ***I like them extra crispy so I put them under the broiler for a few minutes. So there you have it – my ultimate favorite weekend breakfast duo. Both keep & reheat well, so make big batches of both on Saturday morning, & savor all weekend long!